At the beginning of the 18th Century, monks belonging to the Franciscan order of the Recoletos Descalzos (barefoot friars) settled in this area, beyond the borders of what was then Buenos Aires. Their convent and church were dedicated to Our Lady of the Pillar (Nuestra Señora del Pilar, more about, see Iglesia del Pilar). 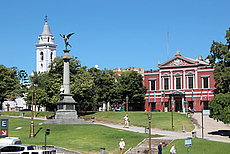 The local population named it La Recoleta, designation that was extended later to the whole area. In the course of a general church reformation under the Government of Martín Rodríguez and his Minister Bernardino Rivadavia, the monks were expelled and expropriated in 1821. The convent's garden was converted into the first public cemetery of the city, and inaugurated on 17 November 1822. In the 1870s, because of a yellow fever epidemic, numerous of the well-situated families of the densely populated quarters of the city center fled to the higher located area in the North, where they built their new villas and elegant residences. Meanwhile, the Recoleta Cemetery decayed, since it was not allowed to bury there victims of epidemics. In 1881, the city mayor Torcuato de Alvear commissioned the Italian architect Juan Antonio Buschiazzo with its renovation in neoclassical style. The front entrance with Doric columns was erected during this time. From then on, magnificent mausoleums were built by the city's rich families for their deceased. The site with an approximately surface of 55.000 sq. has currently about 4.800 vaults. Many famous Argentinians have found their final resting place here. A real pilgrimage site is the tomb of Evita. 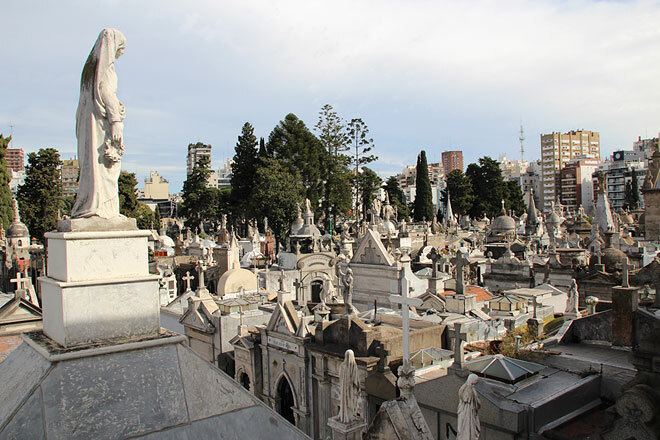 The Cementerio de la Recoleta is one of the most famous cemeteries worldwide, due to its historical importance and artistic quality. From the Cemetery to Basilica Nuestra Señora del Pilar, Centro Cultural Recoleta, Palais de Glace, Museo Nacional de Bellas Artes, National Library and other sights nearby.